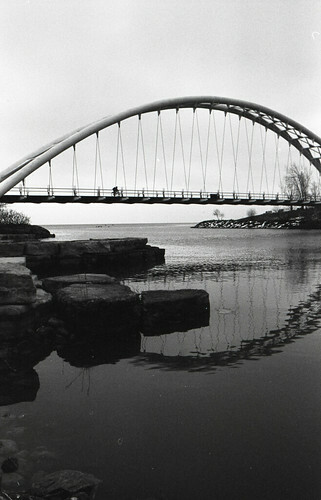 For the past 8 years, predominant location for my photography was Humber Bay Park. This is an amazing place, but I feel that the time has come to turn my attention elsewhere. Humber River has a deep historical bond with this place, Toronto. It is the ancient highway, a powerful and untameable river with complicated history. So, I decided to start turning my attention more towards this river. 2019 will be the year to look at Humber River more closely. A natural place to start is the mouth of the river, a place where a very photogenic bridge combines with its reflection to create the Eye of Humber, almost a symbol of new long term photographic adventure. This bridge and its surroundings must be one of the most commonly photographed places in the city. Good reasons for this include vista of downtown, spectacular sunrises and contemplative space in and around Sheldon’s lookout, just on the West Bank near the bridge. Humber River pedestrian bridge is not only the link between the two sides of the city, but also a gateway of sorts into the world beyond the lakeshore, frontier only Humber River can get you to. So, few days into 2019, I thought it would be fun to bike down to the mouth of the river and shoot a roll of bulk loaded roll of Fomapan 100 film with my lightweight kit – Nikon FM with 35mm f/2.8 AI lens, some filters and the trusty MeFoto Backpacker Classic tripod and a shutter release cable. This is the lightweight kit since it requires very little space and fits in a bike bag along with a tonne of space to spare. This roll of Fomapan has been developed using Balzinal (Compard manufactured R09 formulation) in 1:50 dilution. Right at the mouth of Humber, a start of the new adventure.